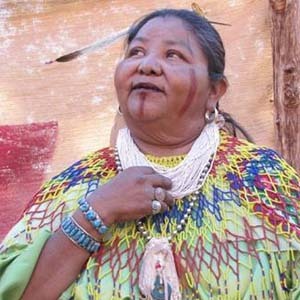 Dianna Sue WhiteDove Uqualla, Havasupai Nation, is a third-generation tribal and traditional leader and practicing ceremonialist recognized for her intuitive abilities. She has served her people on the Tribal Council, including as Vice Chair from 2001-2004, and in many other capacities for the Nation. She has worked in opposition to uranium and other mining in the Colorado Plateau, and in preservation of water. WhiteDove is sought after for her mentoring skills and is an International Peace Advocate. She spends her time teaching, nurturing all that she comes into communion with, facilitating weddings, blessings, demonstrations, dance performances, and talks. She goes wherever Spirit takes her, but she is happiest at her home village of Supai, in the heart of the Havasupai Nation in the Grand Canyon.